Leaders of warring House Republican factions searched for an immigration compromise as some conservatives warned of consequences for Speaker Paul Ryan if he allowed party moderates to push a bipartisan bill through the chamber without strong GOP support. The talks Monday occurred as centrist Republicans remained five GOP signatures away from being able to force party leaders to hold votes on a series of immigration bills. Should they succeed, it would launch a process in which the likely outcome seemed to be passage of a middle-ground measure backed by a handful of Republicans and all Democrats. Ryan has said he will avert that outcome, though it's unclear how, and many conservatives consider it intolerable. Conservative and moderate GOP leaders negotiated privately over ways to win centrist support for a conservative-backed measure that for months has floundered short of the 218 Republican votes it would need for House passage. They discussed changes that would help young "Dreamer" immigrants brought to the U.S. illegally as children and immigrant farm workers stay longer in the U.S., said one lawmaker who described the private discussions on condition of anonymity. The effort to find GOP unity seemed uphill on an issue that has divided the party for years. But the alternative seemed unpalatable for many Republicans, who fear that the centrists' effort will force GOP lawmakers to take divisive election-year votes unless leaders figure out how to head them off. The conservative bill would currently reduce legal immigration, clear the way for construction of President Donald Trump's border wall with Mexico and let Dreamers stay in the U.S. for renewable three-year periods. All Democrats oppose the measure and it would have no chance of clearing the more moderate Senate. Monday's negotiations came three days after bitter Republican divisions over immigration caused an unrelated farm bill to crash. Members of the hard-right House Freedom Caucus helped caused the agriculture measure's defeat after refusing a leadership offer for a vote on the conservative immigration bill in June, which they said was too late. What does farm bill failure mean for Speaker Ryan's future? Rep. Ted Yoho, R-Fla., said it would cause "a lot more disgruntlement" if the moderates prevail, adding, "People in my district want him to go, now." "If we run an amnesty bill out of a Republican House, I think all options are on the table," said Rep. Scott Perry, R-Pa., a member of the group, when asked if Ryan should remain as speaker if the moderates' effort succeeds. Rep. Mark Meadows, R-N.C., the Freedom Caucus leader, said he does not think Ryan should vacate his post if the moderates succeed. But he said House passage of a middle-ground measure would have a "devastating effect" on the GOP because it would "depress anybody who feels like the Republican Party needs to be strong on immigration." Other Republicans said it seemed unlikely Ryan would abandon his post. They said others — including Majority Leader Kevin McCarthy, R-Calif., seen as the likeliest successor — so far lack the GOP votes they'd need to win the job. 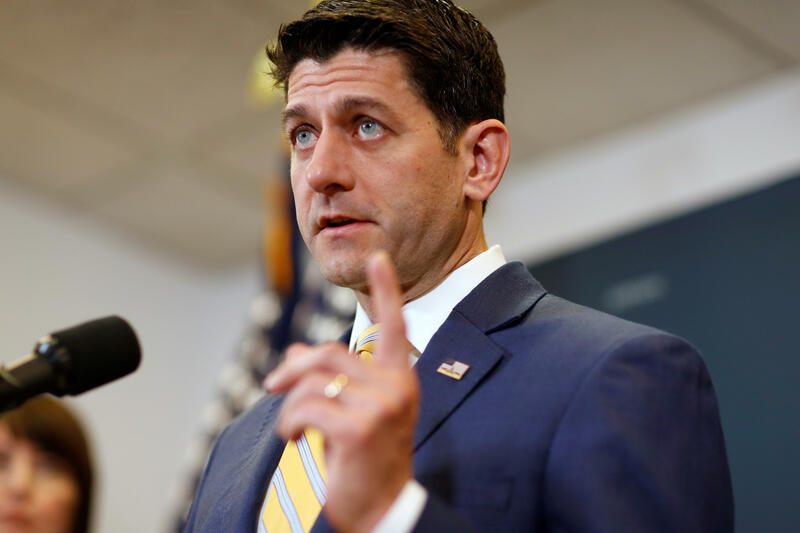 Rep. Dave Brat, R-Va., a Freedom Caucus member, said Ryan has made good on his word to conservatives not to bring up an immigration bill unless it had support from most Republicans. "We just want him to hold true," Brat said. "It's best for stability" for Ryan to stay, said moderate Rep. Ryan Costello, R-Pa.